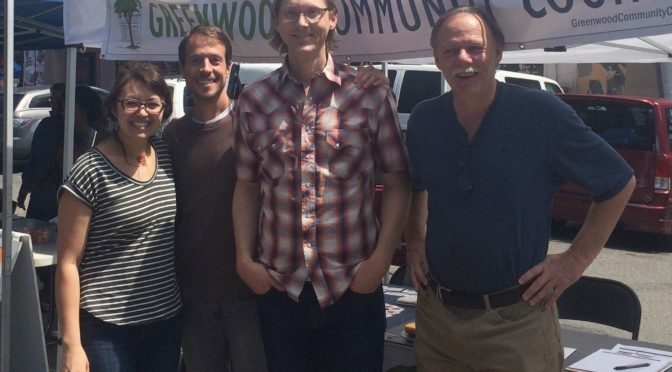 The Greenwood Community Council is a group of volunteers working to build community in Greenwood; provide opportunities to interact with the many people who impact our neighborhood; and provide information, resources and support to help Greenwood voices be heard and make a difference. We are always looking for help! Please fill out the form below if you are interested in being contacted to learn more about volunteer opportunities. Meetings take a lot of work, but they give the opportunity for face-to-face discussion that lets people understand others’ points of view and find solutions to problems with broader support. While the internet polarizes issues and helps people filter out information that doesn’t support their beliefs, meeting face-to-face works against polarization and helps empower people to be heard. The GCC Board comprises nine positions described in our bylaws who each serve up to a two year term (although we only ask a one-year commitment). The board decides what should be done at membership meetings, proposes GCC positions to take to a membership meeting for a vote, decides priorities and directions forward. In practice, the board often do a lot of the work to plan meetings and other volunteer activities described on this page. When we have an active, enthusiastic board, we get a lot done. We have elections each year in March or April for vacant positions. This year all positions will be open to election, although some current board members may choose to run to keep their current positions. If you’ve opened up and read all of this, please give some thought to joining our board! If you’d like to talk to someone about it, let us know. Everyone who lives, works or owns property in Greenwood is welcome, although we especially encourage you to nominate yourself if you would make our board membership more diverse. We are *thinking* about starting a blog and/or newsletter to publish articles and opinions of interest to the neighborhood. If you are interested in writing, let us know and we’ll keep you informed as plans develop. What is the best way to contact you, and when? Is there a specific thing you'd like to work on, or is there anything else you'd like to mention? GCC will not meet in April. This video highlights concerns of Greenwood businesses about their future in the neighborhood. Here's video from Councilmember Mike O'Brien's visit with the Community Council on June 18. What mailings do you want to receive?